A half-century later, Ted’s autograph is the same! Topps recycled his photo from 1954, right? 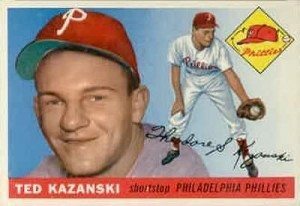 Infielder Ted Kazanski wasn’t the angry young man stereotype so common in pro sports today. The Ballplayers bio notes that he was “one of the most highly rated schoolboy players of his time.” Kazanski reached the majors while toiling under the “bonus baby” banner. Surprisingly, he had nothing bad to say about the press coverage he received. When 20-year-old Ken Griffey Jr. hit an inside-the-park homer, baseball historians looked to 1956. The National League had its own “Kid,” too. Thanks to http://www.retrosheet.org/, the day remains! “Tom, Thanks for being a fan of baseball. It’s a great game! Kazanski is great. I interviewed him last year when Angel Pagan tied his record of hitting an inside the park home run and starting a triple play in the same game. It can be read here. Nice work linking the past to the present. Thanks for sharing!